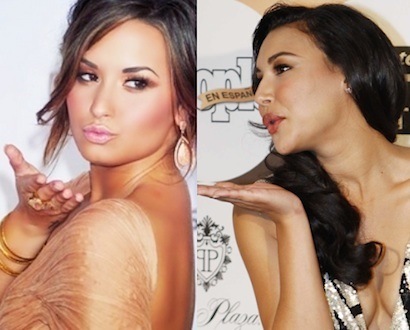 I suppose Naya Rivera and Demi Lovato have little in common besides being famous Latina women with strange names, but during season 5 of Glee they will share a duet, a dance and probably even a kiss. It was confirmed last Sunday by Rivera that the 21-year-old “Heart Attack” singer will be playing her struggling artist girlfriend. “She’s playing my love interest so I’m very, very excited about that,” she said. Does anyone watch Glee for any other reason than Santana at this point? She’s the best singer with the best lines but I fear her career will end after the show because movie and TV casting directors are idiots. I’m STILL obsessed with her and Amber Riley doing Adele + Brandy and Monica. oh just because they are Latina women you think they have weird names that is so messed up.